RunFine supplies Spherical Plain Bearings SI-ES Series with a threaded shank with a right-hand thread as standard. With the exception of Rod Ends with the designation suffix VZ019, Rod Ends Spherical Bearings SI-ES Series are also available with a left-hand thread. 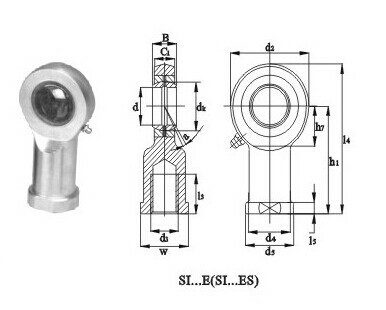 Rod Ends Spherical Bearings SI-ES Series are identified by the designation prefix L.
Rod Ends Bearings SI-ES Series consist of an eye-shaped head with integral shank that forms a housing for a spherical plain bearing. As a rule, rod ends are available with left or right-hand female (internal) or male (external) threads. Rod Ends Bearings SI-ES Series are also available for specific applications, for example where a rod end is attached to the end of a piston rod or at the base of a hydraulic cylinder. For those applications, RunFine manufactures rod ends with slotted shank and a compressible threaded section or with a "welding shank", means a shank suitable for welding to another component. Looking for ideal Rod Ends Spherical Bearings SI-ES Series Manufacturer & supplier ? We have a wide selection at great prices to help you get creative. All the Spherical Plain Bearings SI-ES Series are quality guaranteed. We are China Origin Factory of Rod Ends Bearings SI-ES Series. If you have any question, please feel free to contact us.